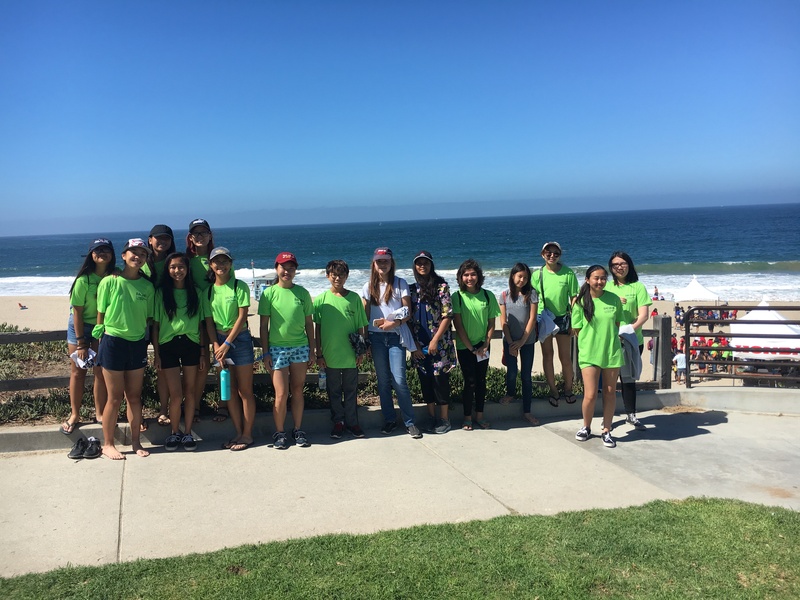 On October 15, 2018, 15 members of MKHS Heal the Bay went to Torrance Beach for Coastal Cleanup Day. The club had partnered with a Torrance Pharmaceutical Company, Bachem. Bachem gave free t shirts to all of its volunteer employees and offered them to the club members as well. This helped club members and employees bond over service. After listening to a safety talk, the organizers informed us that they hid 3 golden starfish out in the beach for us to find. If we found these starfish, we would receive a prize. We couldn’t wait until we could get on the beach to start looking for those starfish. We agreed to split up into groups and meet up at 11:30 at the top. The organizers gave us burlap-like trash bags to gather our trash in. These trash bags were emptied of their trash in a trash can and reused for new volunteers, reducing accumulating trash. There were already many people out on the beach cleaning up when we started. It was difficult to find trash on that beach, which was amazing. 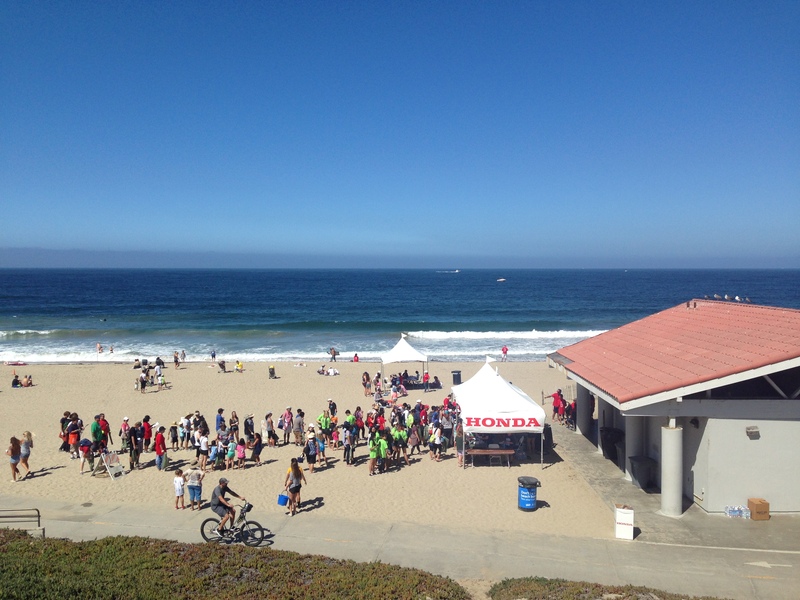 The city of Torrance kept a well-maintained and clean beach. My group of 3 looked in the clumps of seaweed to find trash, and found many tiny bits of Styrofoam. But there was not much trash that was visible. As we were walking around the coastline, we bumped into many other groups who were cleaning up, including people from high school environmental classes, Boeing, Honda, and elementary classes. While the club members and majority of beach volunteers focused on finding trash to pick up on the beach and finding the starfish, my parents walked up to the beach parking lot. They were surprised to see how much trash was up there, compared to the small amount of trash down at the beach. They filled their bag with trash within 10 minutes. Meanwhile, my group was still searching for trash down at the beach. We found a dinosaur toy a kid left behind and the bottom part of a shoe. Time passed by very quickly and soon it was 11:30. The club members met up at a booth to turn in our trash bags. 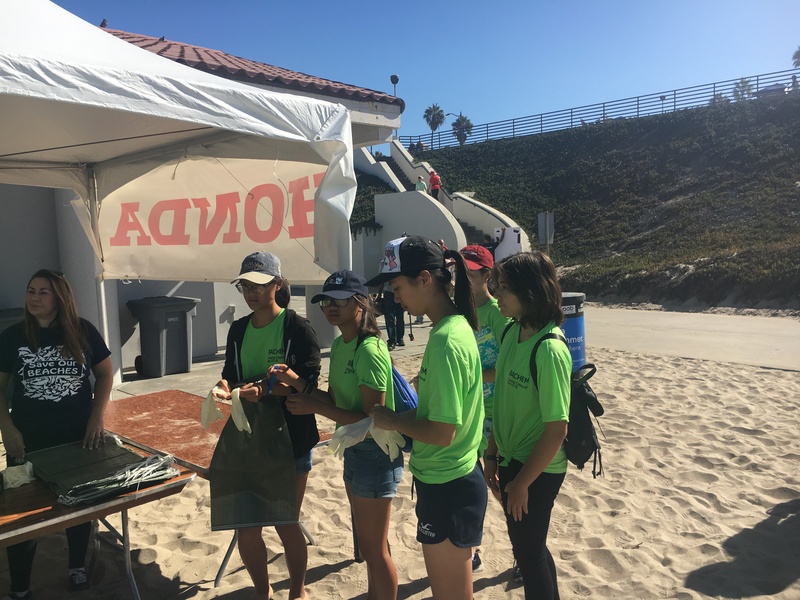 As a thank-you for volunteering, the City of Torrance allowed us to choose one of 3 environmentally friendly gifts: a reusable metal straw with a pipe cleaner, a set of bamboo utensils, or a t-shirt that said “Save Our Beaches.” We were also given a voucher for a taco-truck lunch. During lunch, the employees from Bachem and the members from MKHS Heal the Bay were able to bond some more. We thanked them for allowing us to partner up with them for Coastal Cleanup Day. The project made club members realize how much clean environments should be respected and maintained. I have always enjoyed participating in community cleanups, and was glad to share the experience with many of the club members. Our club would like to thank the Bachem company again for letting us work with them.